Much will depend on whom he surrounds himself with. But at least he’s put the question on the table. The presidency of Donald J. Trump: One still emits a quiet gasp when uttering the phrase. It will take time to get beyond this, in part because nearly everything is uncertain now, as all understand. This applies even more to foreign policy than to President-elect Trump’s—gasp, again—domestic plans. Things could be no other way at this early moment, given the nature of Trump’s campaign and what he stands for: Trump’s elevation, like Andrew Jackson’s 187 years ago, is a cri de coeur, a visceral shout of resistance to conditions here at home, at least as much as it is a reasoned statement of intent. All detail and specificity are yet to come; on the foreign side we have little more than phrases that would fit on billboards. We have questions, however. They are two and pressing. One, will our 45th president disrupt the post-1945 international order, prompting recalibrations and realignments few of us were able to imagine even a year or so ago? And the post–Cold War order? “Cold War II” emerges—regrettably, pitifully—as the simplest name for it. Improbably or otherwise, will Trump open us to something more imaginative and constructive—something approximating order, indeed? These are closely related but finally separate matters. To state my case straightaway: I count a top-to-bottom remake of the global order an urgent task—altogether desirable. Stability, to put the point another way, cannot be counted a positive value in and of itself. It is beneficial or not only in context, and in our current context it is not, by any disinterested measure. Before you dismiss this as adventurist tripe, let me take a sec to remind you of dynastic China in its late-imperial phase. It is perfectly relevant to our circumstances. For the Qing, the established order was to be maintained because it was the established order; the tradition was honored because it was the tradition. This was late-Qing’s gravest error. Atrophy, weak-mindedness, and decline resulted. I used to think it very weird that Alexis de Tocqueville, in the second volume of Democracy in America, invoked imperial China to warn of the new republic’s most serious vulnerability: Fat and happy, the New World’s democrats will live by received wisdom and resist all thought of change. When we consider American liberals and their global order, notably in its neoliberal iteration, we find the only thing weird about the great Frenchman’s thought to be its prescience. Wedded to orthodoxy, grossly intolerant of difference, incapable of thinking for themselves, those who fashion and defend the liberal order as we have it are straight out of Tocqueville’s pages—“flabbily following the course of their destiny,” sheltering righteously within a “democratic despotism” of their making. This is true at home and true abroad. Now to the above-noted questions. Hillary Clinton’s foreign-policy positions did not defeat her, just as Trump’s did not win him the White House. The political fight was won and lost on domestic ground. But Clinton’s thinking carries over from the domestic to the foreign, and so does Trump’s. We have it right, she asserted a thousand times, now let us make minor adjustments. As she said of her foreign-policy goals in her much-noted interview with The Atlantic two years ago, “Peace, progress, and prosperity. This worked for a very long time.” This is the ideology of exceptionalism as we have had it since the early 19th century. One cannot tell whether Trump is an exceptionalist—he does not take it to the Clintonian extreme, certainly—but his fundamental position is perfectly clear: We do not have it right. It has not worked—not at home and not abroad. Can we dispense with all the Cold War–ish Russophobia, please? There is now high anxiety in the capitals of core Europe as to whether Trump will cause a breach in longstanding alliances across the Atlantic. The same anxiety is evident in Tokyo and Seoul. “Muted bewilderment,” as The Sydney Morning Herald put it Wednesday, is what you find among other bedrock clients across the Pacific such as Singapore and Australia. Elsewhere, something else: Even amid Trump’s China-bashing—boilerplate when in fashion, now a decade or more out of date—Beijing long back signaled its preference for Trump over the overtly hawkish Clinton. Vladimir Putin indicated his desire to rebuild relations with Washington within hours of Trump’s victory. No surprise there: As those WikiLeaks releases now inform us, Clinton’s agenda for Russia was “regime change” at least since her years as secretary of state. The questions at the root of all these responses are ours: Will the postwar security framework be broken apart? Can we dispense with all the Cold War–ish Russophobia, please, and get down to the business of constructive engagement on the basis of shared interests? My answer is yes in both cases, and so we ought to hope, but let us pile on the qualifiers. Yes, Trump could get this done if his views as so far expressed prove to be thought-through convictions. Yes, depending on whom he appoints at State, Defense, and elsewhere. Yes, depending upon the balance of power between the Trump White House and the national security apparatus. And finally, this big one: Yes, but are those favoring an alternative American foreign policy now supposed to put their marbles in Donald Trump’s basket? Last question first. The Nation’s editorialists argued months ago that Trump is an appalling vehicle—was “terrible” the word?—to bear the message of change in US foreign policy, but it is a question of the song, not the singer: We must set aside the hair and all else so as to consider what merits the message may have. This proved a divisive matter during the campaigns, as anyone paying attention already knows. Fine. Always good to question. But to take the most obvious case: There will be no ground now to object should Trump proceed to correct our disgracefully destructive determination to sabotage all promise of useful relations with Russia, as Washington has done for more or less the whole of the Obama years. How Will Trump Reshape the Middle East? I consider improved relations with Russia, as the above should make evident, the single most promising prospect Trump’s penciled-in foreign policies hold out. And a good thing, too: The damage the Obama administration has overseen in bilateral ties will otherwise stand as the most consequential of his many foreign-policy failings. Not least, from a more cooperative tone between Washington and Moscow may flow common cause—and eventually a solution, dare one suggest it—in Syria. But a caveat here: Hundreds of national-security people left over from the Bush I and Bush II presidencies signed letters renouncing Trump earlier this year—remember them?—and some are already breathing fire about the grave danger Russia represents. In this, Trump has grasped a third rail. Vicious animosity toward Russia is simply too vital to the maintenance of (1) a politically useful national paranoia and (2) a steady flow of defense contracts to overcome easily. Watch this space. Europe, NATO, Japan, South Korea: One understands the anxieties but harbors limited sympathy. In the post-1945 context, Europeans, Japanese, and Koreans have exhibited two identical tropes. One is restiveness under Washington’s “security umbrella”—our silly euphemism for a dominance that is often managed crudely. 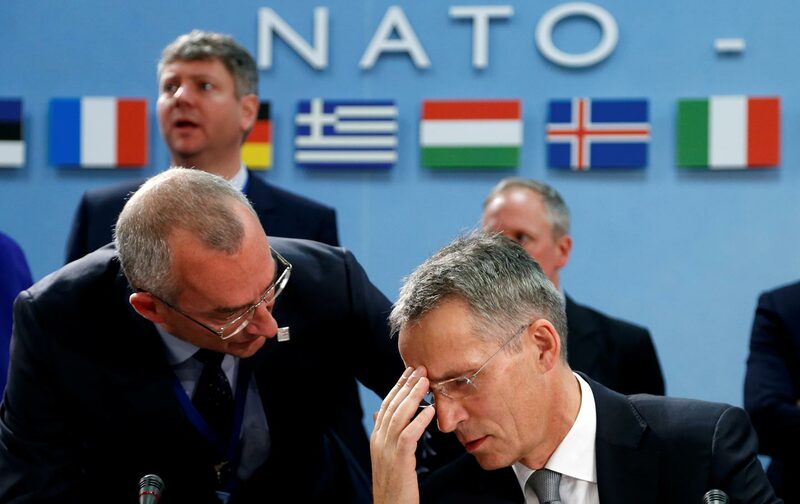 (Europe’s unhappiness with the US-Russian confrontation is a case in point.) Two is an unbecoming condition of slothful dependence, to put the point a little too simply. I have long been disappointed that Europe has failed to find any kind of independent voice; the world might be a better place if it had one. If Trump the dealmaker requires that they ante up more fairly in support of NATO, well, maybe they will consider, de Gaulle–like, how much they truly need an expensive, too-aggressive organization that has—but emphatically—lost its purpose, just as Trump argues. As to Japan and South Korea, the security treaties’ humiliating aspect has long gnawed at the body politic in both nations, and, especially in the Japanese case, it would do them and all others in Asia a power of good were they to find their feet and stand on them. China and Trump’s anachronistic complaints, Iran and the agreement governing its nuclear program: These are pressing questions, too, and one cannot judge Trump’s position on either. He is too muddled, too out of touch with complex realities. The State Department long ago ran dry of good Sinologists, so Trump will either find some or he will break his pick with the Chinese. Ditto in the Iran case and many others: Much will depend on whom No. 45 surrounds himself with. It is utterly unclear what Trump’s actual position on any given question will turn out to be, and unclear again how much of it he will realize. So we must wait. One cannot look to him, finally, as the president who will turn American foreign policy in the laudable new direction we sorely need. His emphasis on a huge new military buildup, indeed, suggests just the opposite. But he has put questions on the table. He has chiseled loose a brick or two in the wall, which is more than Hillary Clinton or anyone still active in the policy cliques can claim. The Chicago Council on Global Affairs just reported that, divided as Americans may be among themselves, their longstanding “consensus” on foreign policy is reassuringly intact. To the extent that this has ever been so—and one must vigorously question the thought—this is what must be broken. Best outcome, and with a degree of uncertainty and mess that must be accepted, Trump stands to open some ground on which to begin the conversation about doing so.